Opee is only 8, but he's already a popular veteran in the down and dirty sport of motocross. He can pull 6 Gs. He's been the centerfold for Cycle News and poses regularly for fan photos. He's a survivor of the grueling Baja 500 and has racked up more than 10,000 hours on a dirt bike. Sometimes, you can barely see the 70-pound pooch - a blue merle Australian shepherd - through the dust on his goggles and his custom helmet, complete with cam. "I am his biggest fan," said Mike Schelin, Opee's owner, race partner and a purveyor of used motorcycle parts from a shop next to his mobile home. Schelin got the dog in 2001 shortly after his divorce. He raises him with other dogs and two horses at a spread he calls Miracle Flats. Known as "The Dogfather" to some in the sport, Schelin always takes a back seat to Opee. "He was my instant best friend," Schelin said. "He slept in my tool bag. There was something about him. He's had charisma since Day One. I knew I had a dog who could make a difference." 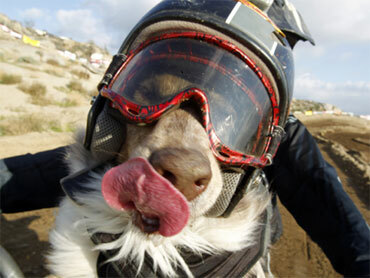 Schelin, 41, realized he had a four-legged motocross fan as a pet when he started riding in the desert with Opee on the chase. "I felt bad for him, he would run so long." So Schelin bought a four-wheeler and they went desert riding together. The dog didn't like the dust in his eyes, so Schelin got him goggles. One day, Opee ditched the four-wheeler and hopped on the motorcycle tank, where he's been ever since, Schelin said. If the bike isn't moving, Opee will just fall asleep on the tank. They keep it bare because they've never found a covering that's comfortable for the dog, Schelin said. Reaction to Opee was magic. He was an instant canine ambassador to off-roading. Finding sponsors was no problem and soon Opee had his own custom gear, including a specially made neck brace, inflatable vest, backpack, water supply and several jerseys. He got his American Motorcycle Association card and his SCORE International card, the latter so he could race in Baja. The dog does lots of other things, too. He's been a search and rescuer, a California assistance dog and visits kids in hospitals with Schelin. They regularly work crowds at races in the area, including the Supercross in Anaheim. Opee appears to be Schelin's biggest fan as well. "From what I see, he loves Mike and would go anywhere with him," said Ricky Johnson, a seven-time national motorcycle champion who owns Perris Raceway near Schelin's place. Opee and Schelin race, but not to win. Because they're different and for safety's sake, they always start in the rear and they only compete with the cyclist in front of them, Schelin said. Schelin's greatest triumph came when his five-member team - with Opee in the driver's seat for 276 miles - finished the cross-country Baja 500 with 10 minutes to spare - in 17 hours, 49 minutes, 36 seconds - and ahead of half the pack. "The average person races eight times before he finishes," he said. In the beginning, Schelin had trouble seeing around Opee, but they worked out shifts and leans and it's seldom a problem now. Schelin also uses voice commands. "When we come up to a jump, I tell him to set it up and he will drop down and give me more of a view," Schelin said. If they're at the bottom of a cliff or big hill and there's too much weight, he just tells Opee to get off and meet him at the top. Schelin doesn't go racing without Opee these days. "I can't go as fast without him. I can't jump as far without him. I don't feel as safe without him. He's become a natural part of the bike with me. We have this natural rhythm." Even the most skilled motocross racer has a plaster cast past and Opee is no exception. His worst crash came in the 2006 Baja 500. "We took a spill at 75 mph in the dirt and went into a 40-foot skid," Schelin said. The dog isn't attached to the bike or Schelin in any way. He skinned his nose and scraped his paw. Schelin sliced his leg. The injuries weren't enough to put them out of the race though. "I would never do anything to hurt my dog," Schelin said. "Opee keeps me in check at all times. If he doesn't jump up on the bike, we don't go." Schelin is not only racing partner but stage dad for his dog, with a few goals for the future: Do a back flip with Opee into a foam pit ("he would hold on the same way I do - gravity"); see Opee recognized as the fastest dog on the planet (he's written to Guinness); take a tandem skydive; and go to the movies to see Opee in a major motion picture. Schelin answered a Hollywood agent's TV ad three years ago, but he hasn't heard back and is looking for representation. Opee, he said, is too talented to go undiscovered. "The only thing missing is the cape."